The material of the races, the rolling element, shaft and housing can be selected to be steel or Si3N4. The list is taken from the database therefore it can be extended by the user. Also ‘own input’ is available and the material data can be defined using the -button. For material data, the Young’s modulus, the Poisson number, the density, the thermal elongation coefficient and the thermal conductivity can be defined. This data is used to calculate the operating clearance and the load distribution within the bearing. The thermal conductivity is used to calculate the thermal resistance for ball bearings according (Nakajima, 1995). Optionally, a static permissible stress can be defined which is used for the calculation of static load capacity and static safety factor. The default value is 4000MPa for roller bearings and 4200MPa for ball bearings. 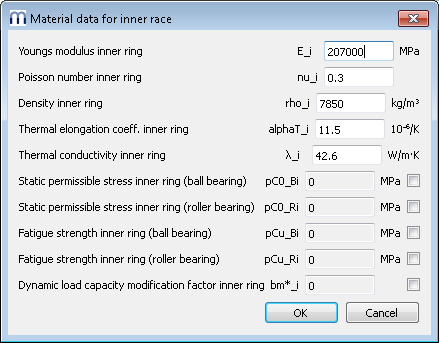 For spherical ball bearings, the permissible stress is multiplied by 4600/4200 for the outer ring internally by the software. The fatigue strength is used for the calculation of the fatigue load limit Cu. The default value is 1500MPa, it can be overwritten by the user. The dynamic load capacity can be modified dependent on the material selection, too. The bm*-factor is multiplied to the dynamic load capacity according ISO 281. This allows to consider a material influence on dynamic load capacity. A different value can be used for inner and outer race. The value of bm*-factor for the rolling element is only used for the calculation of rolling element set life, it does not affect the dynamic load capacity of the bearing.